Of light is ever seen. This entry was posted in books, creative writing, k morris poet, literature, musings, newauthoronline, poems, poetry, uncategorised and tagged evil, ghosts, ghouls, haunted spaces, k morris poet, kevin morris poetry, on a sunny day, poems, poets on March 29, 2019 by K Morris Poet. (“Ghosts” can be found in “Dalliance; A Collection of Poetry and Prose”, which is available in the Amazon Kindle store and can be found here, https://www.amazon.co.uk/dp/B00QQVJC7E/. 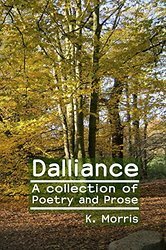 This entry was posted in books, creative writing, literature, newauthoronline, poems, poetry, uncategorised and tagged dalliance a collection of poetry and prose, ghosts, k morris poet, kevin morris poetry, newauthoronline, poems, poets on February 25, 2019 by K Morris Poet. As they pass the graveyard plot. This entry was posted in books, creative writing, literature, newauthoronline, poems, poetry, uncategorised and tagged As I walk through the graveyard on Halloween, ghosts, ghouls, k morris poet, newauthoronline, poems, poetry, poets, the occult, witches on October 28, 2018 by K Morris Poet. Who lived in a haunted manor. In a most delightful manner …! So she left that haunted manor! This entry was posted in books, creative writing, literature, newauthoronline, poems, poetry, uncategorised and tagged ghosts, haunted houses, humorous verse, humour, k morris poet, newauthoronline, nonsense verse, there was a young lady called anna on September 13, 2018 by K Morris Poet. Who died one bleak midnight. I received a terrible fright! I said”please, turn on the light!”. That she haunts her house at night! But I didn’t see Miss White! This entry was posted in books, creative writing, literature, newauthoronline, poems, poetry, uncategorised and tagged ghosts, humorous verse, humour, k morris poet, newauthoronline, nonsense verse, poets, There was a young lady called white on July 28, 2018 by K Morris Poet. Or shadows on the walls. While fervently praying for the coming of day. This entry was posted in books, creative writing, literature, newauthoronline, poetry, uncategorised and tagged ghosts, ghouls, haunted houses, k morris poet, newauthoronline, poems, poetry, poets, scepticism, sceptics, spirits on December 26, 2017 by K Morris Poet. This entry was posted in books, creative writing, literature, newauthoronline, poetry, uncategorised and tagged Come Halloween, ghosts, ghouls, graveyards, humorous verse, humour, k morris poet, newauthoronline, poems, poetry on October 28, 2017 by K Morris Poet.